Research Verified Caralluma Fimbriata Review - Does It Work? The objective of this article is to review Research Verified Caralluma Fimbriata in length and great detail. Irrespective of multiple products in the Caralluma Fimbriata supplement category, the one by Research Verified is outstanding because it satisfies almost all the criteria that is given by popular clinical studies that is required for high degree of appetite suppressing and weight loss effects. 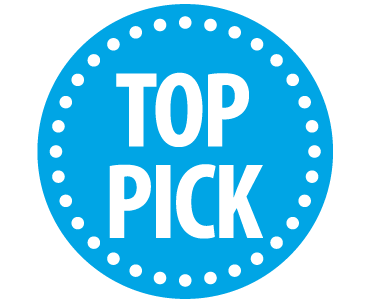 This Research Verified brand review discusses the benefits of purchasing from this manufacturer. The pureness and quality standards of the ingredients used in this product are unparalleled compared to other products available in the market. 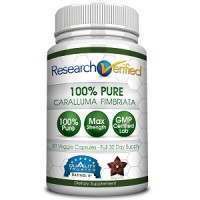 Go through the complete review to educate yourself about Research Verified Caralluma Fimbriata. 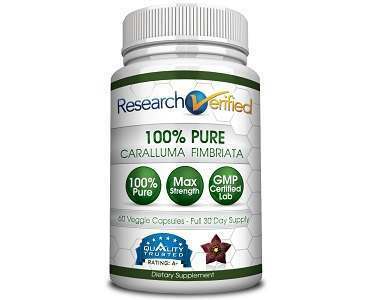 Research Verified Caralluma Fimbriata is a natural product that consists of no artificial ingredients. It consists of Caralluma Fimbriata whole plant extract in the ratio of 10:1 which has 1600 mg serving size, a day. It is known for its 100% purity and it is a vegetarian capsule. The dosage of this product suggests users to have 1600 mg serving size per day. This means that two capsules 800mg each can be taken per day. The capsules must be taken atleast half an hour prior to meals and you must consume adequate water after that. Caralluma, in general is known for side effects such as constipation, intestinal gas and stomach ache though these side effects may not last long. However Research Verified Caralluma Fimbriata is a natural product manufactured in FDA registered labs that makes high quality products. So no side effects are stated overtly. However manufacturer of this product has very clearly stated that the use of this product is not recommended when you are pregnant or when you are breastfeeding. So it is advisable to stay safe by not using the product in those circumstances and also consult your doctor before you plan to use it. Same condition applies to children within 18 years of age and people who are prone to allergic reactions and who have a prominent medical ailments. The three pricing options for this product comes with a one month supply that costs $48 for one bottle, three month supply that costs $98 for three bottles and a six month supply that costs $142 for six bottles. When you buy the six month supply, you manage to save the most which is close to 66% because each bottle in this package costs only $24 compared to $48 which is the price of a single bottle in the one month supply package. Research Verified offers a 365 day money back guarantee for all its products and Research Verified Caralluma Fimbriata is no exception. This option encourages you to buy the product and try it boldly because during the course of time of usage and within 365 days from the date of purchase, if the results don’t match your expectations then you can return them back and still be eligible for a full money back guarantee exclusive of shipping rates. When we try to review Research Verified Caralluma Fimbriata side by side with other Caralluma Fimbriata products, this product is absolutely fulfilling for any potential buyer because it meets and exceeds the criteria mentioned by clinical studies and healthcare experts. It has top rating from QualityTrusted.org, a mind-blowing refund guarantee policy and attractive pricing. Needless to say, high quality is obvious because it is manufactured in a cGMP certified lab that complies with the high quality standards of the industry. This product is great value for money and aids weight loss by suppressing appetite and improving fat loss.